During pregnancy, the thoracic spine (your upper back) tends to stiffen. This stiffening restricts the extension and rotation ability of the thoracic spine. Our bodies operate as a system, and if one gear is off, it affects the system as a whole. If the thoracic is restricted, other components of our spine need to increase in mobility in order to compensate. This tends to result in neck and/or low back pain, as our cervical and lumbar spine become more mobile. A restricted thoracic could also affect breathing, as the thoracic is where our ribs attach. Breathing requires mobility in the ribs, and a stiff thoracic may also restrict the mobility of the ribs, thus affecting breathing. 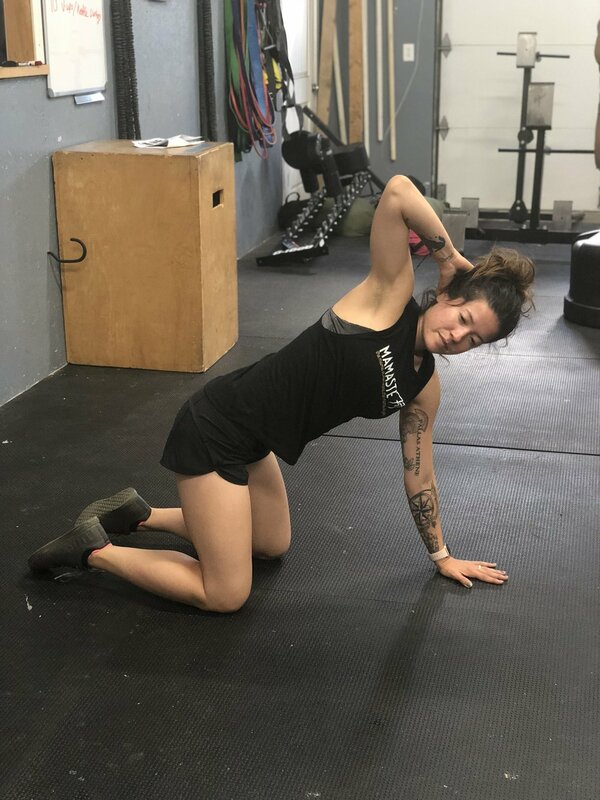 Let’s break down our thoracic mobility sequence we use during our prenatal and postpartum fitness classes. 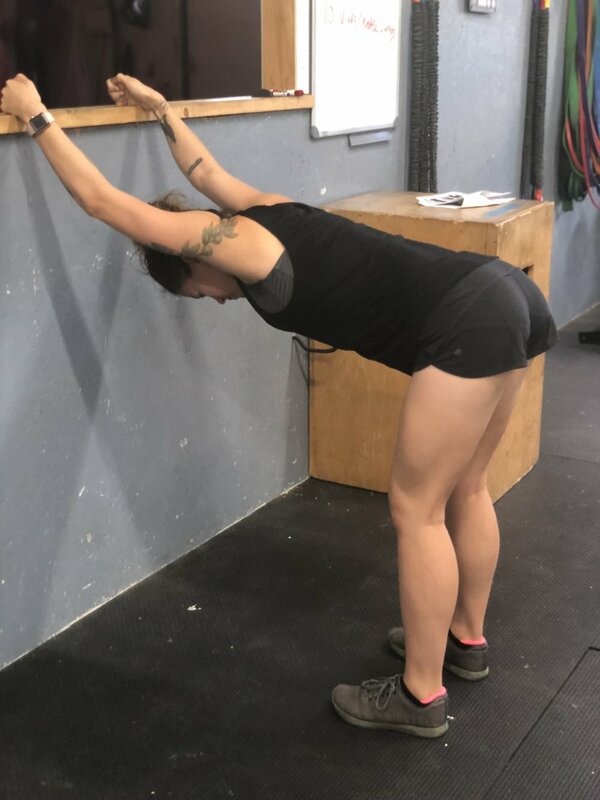 The thoracic is meant to extend, or straighten up. Sometimes there is a tendency to round excessively in the upper back, as we slouch or collapse into ourselves. Place the hands on a surface that is roughly shoulder or chest level. 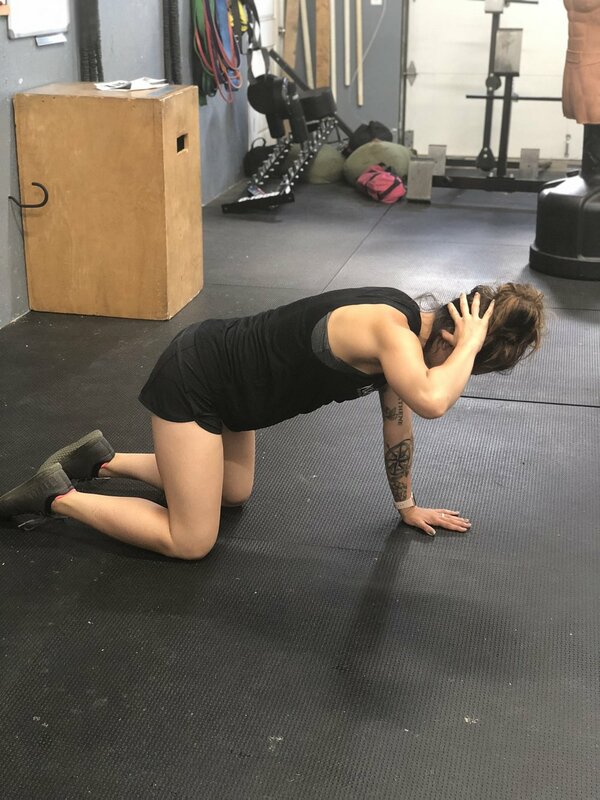 Lean forward, focusing on the upper back or chest pushing towards the ground. You should feel a stretch in the upper back. You can adjust the hand positioning, either keep your palms facing down or thumbs up with palms facing each other. Extension of the lower thoracic spine can be done with a foam roller. Lay on the foam roller, with the pivot point around your mid back, and then let yourself fall over it. You can keep the head lifted, if that’s more comfortable for you. Focus on allowing your spine to “wrap” around the foam roller. The thoracic spine has a higher degree of rotation than the lumbar spine, and is meant to be where rotation occurs. A functional core component is our ability to rotate in space. The starting position is on all fours, with one hand behind your head. Rotate towards the bend arm, focusing on rotating in the chest. Your hips should start relatively square as you twist. Hold the top position for a few seconds, then repeat the rotation ten times on each side. If kneeling is uncomfortable, you can also do this seated or standing but may have less leverage standing.